One thing all presidential candidates should be able to agree on in this polarized political climate: Never turn down a photo op. Whether you’re showing your “woman of the people” cred by ordering up a few bags of Cheeze Kurls in Michigan or you’re confusedly manning a grill at the Iowa State Fair, it’s important to show the residents of whatever whistlestop you happen to be making that you’re totally into their local curiosities. Ted Cruz failed on that front yesterday, at least from the point of view of your author, who happens to be a proud Wisconsin resident. Cruz made a stop at the Mars Cheese Castle outside Kenosha—a well-known highway pit stop that specializes in three of the dairy state’s greatest exports: Cheese, sausages and beer. As southern Wisconsin cheese castles go, Mars is certainly one of the best. And while Cruz strolled the grounds with former presidential candidate and current governor Scott Walker, Cruz’s daughter gave her dad the perfect opportunity to identify himself more strongly with the people of Wisconsin. 7-year-old Caroline tried to put a cheesehead on her father’s head, which, we can all agree, would have been adorable. Cruz rebuffed his daughter, citing the law of politics that says no presidential candidate shall be caught wearing a funny hat. Cruz does make a good point that the whole hat thing didn’t work out well for Michael Dukakis and his fateful ride in a tank during the 1988 election, but the cheesehead is practically the official uniform of the state of Wisconsin. We’ll have to see what happens with the results tonight. 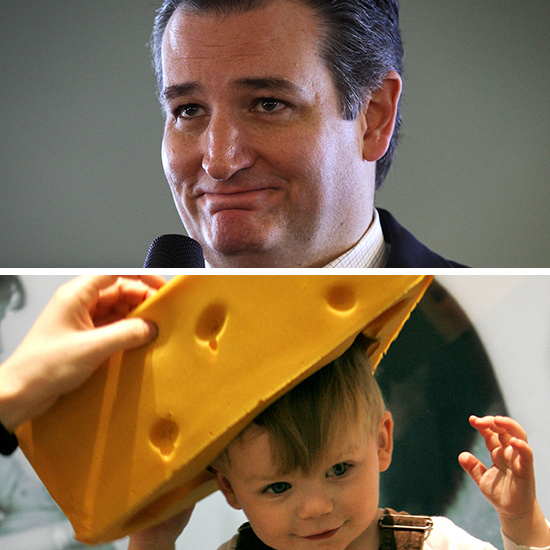 The recent polls showed Cruz ahead of Trump and I’m not saying cheesehead-gate could change that, but it couldn’t have helped. You can see the great offense Cruz committed against the entire population of Wisconsin below.